NEW YORK, NY (September 5, 2017) –Tiffany & Co. today announced the launch of its Tiffany Save the Wild Collection to benefit the Elephant Crisis Fund (ECF), an initiative of Save the Elephants and the Wildlife Conservation Network in partnership with the Leonardo DiCaprio Foundation, which aims to stop the slaughter of elephants and the trafficking and demand for their ivory. In 2016 as part of an ongoing effort to fight wildlife trafficking, Tiffany lent support to the ECF and its inaugural fashion-focused #knotonmyplanet campaign, where industry influencers pledged to never forget elephants by symbolically tying a knot and committing to make donations to ECF projects to end the ivory crisis. Profoundly threatened by ivory poaching and habitat loss, elephants are in crisis, with up to 30,000 killed each year. Tiffany is donating 100% of the proceeds from this collection, which will be sold worldwide to support anti-poaching, anti-trafficking and ivory demand reduction projects around the world. The jewellery collection features elephant charms and brooches in 18k rose gold with diamonds and sterling silver accented with tsavorites, a stone which Tiffany introduced in 1974 after it was discovered in a region near Tsavo National Park in Kenya, which is also home to the big tuskers of Africa – elephants whose tusks have grown so large they reach the ground. Since its founding in 1837, Tiffany has had an enduring relationship with nature, which is both the ultimate inspiration for its designers, and the source of the precious materials that give life and form to their iconic collections. From vocally opposing mines on sensitive lands and speaking out against the use of coral in jewelry, to protecting marine ecosystems and even relocating black rhinos through its Foundation, Tiffany continues its support of wildlife conservation. In collaboration with the U.S. Wildlife Trafficking Alliance, last year Tiffany joined a broad coalition of 16 companies who are making a commitment to stop the demand for illegal wildlife products. “Elephants are in crisis, beset by the ivory trade. The challenges are global and complex, and to secure a future for elephants we need an alliance that spans continents and sectors. The support of Tiffany & Co. and industry colleagues could be a game changer. 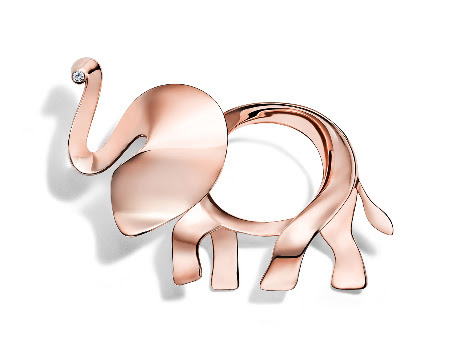 By donating all profits from their exclusive collection of elephant charms and brooches to the Elephant Crisis Fund, Tiffany & Co. are making an important commitment to protect one of the greatest icons of the natural world. May their leadership prove infectious,” said Frank Pope, CEO, Save The Elephants. The Tiffany Save the Wild Collection of charms and brooches will available for purchase in stores and online in September 2017. Tiffany, Tiffany & Co., T&CO. and Tiffany Save The Wild Collection are trademarks of Tiffany and Company and its affiliates.